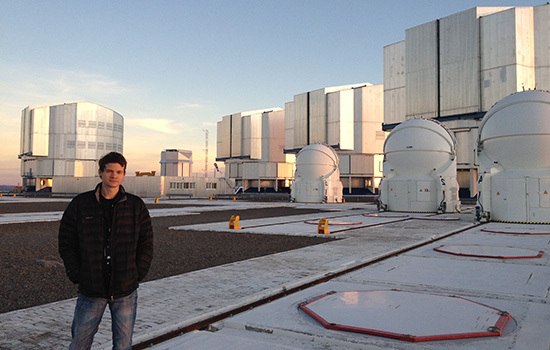 Grant Tremblay ’11 (astrophysical sciences and technology) uses some of the most powerful telescopes in the world to study supermassive black holes and young stars that form around them, and the dynamics of galaxies as they grow and evolve. Tremblay is an astronomer and a NASA Einstein Fellow at Yale University whose research appeals to the popular press with exotic discoveries like a cold “rain” of gaseous clouds falling toward a supermassive black hole, “fountains” of cold gas pumped by black holes and beaded strings of young stellar superclusters winding around ancient galaxies. Tremblay is grateful to make a living by asking his own questions about the universe and pursuing the answers. His enthusiasm for discovery is driven by the sobering reality of one who studies the effects of time on the universe. Tremblay, a self-described “space-nerd kid,” went to college to become an astrophysicist. He earned a BS in physics and astronomy from the University of Rochester and, while there, met two RIT professors who would become his mentors, collaborators and life-long friends. Stefi Baum, former director of the Chester F. Carlson Center for Imaging Science, and Chris O’Dea, then-professor of physics, encouraged him to enroll in RIT’s upcoming graduate program in astrophysics. Baum helped Tremblay land a job at the Space Telescope Science Institute, where he waited for two years for RIT’s astrophysical sciences and technology program to start in 2008. “It turned out to be one of the greatest decisions of my life,” he said. Tremblay learned the tool set he would need to conduct his Ph.D. research and was one of the first to graduate from the program. Shortly after defending his dissertation, Tremblay began a post-doctoral fellowship at the European Southern Observatory near Munich, Germany. The three-year research position included working as a support astronomer at one of the most advanced ground-based telescopes in the world. Tremblay returned to the United States to accept an Einstein Fellowship supported by NASA’s Physics of the Cosmos program. He picked Yale as his host university during the three-year fellowship to collaborate with C. Megan Urry, director of the Yale Center for Astronomy and Astrophysics. While at Yale, Tremblay inherited an outreach role as organizer of the New Haven, Conn., chapter of Astronomy on Tap, a series of informal talks about space held at bars or casual restaurants. Many have started their professional careers as postdoctoral fellows and research scientists at observatories, institutes and universities around the world, including the European Southern Observatory, the SRON Netherlands Institute for Space Research, the University of Guelph in Canada and the Universidad Diego Portales, Santiago, Chile. Others have become lecturers, outreach astronomers and web developers at Joliet Junior College; RIT; West Virginia University; the Dudley Observatory at the Museum of Innovation and Space in Schenectady, N.Y.; and Bowst in Portsmouth, N.H.